Shell’s Grounded Drill Rig Seen From Space – Other Problems Not So Obvious? Lots of folks lately, us included, have chronicled Shell’s confidence-shaking series of missteps, bad decisions and outright failures associated with their years-long, multi-billion-dollar campaign (technical and political) to drill for oil in the Arctic Ocean off the coast of Alaska. Shell has decided to downplay their latest mishap — losing control of their multimillion dollar drill rig, the Kulluk, while it was being towed to Seattle from the drilling site in the Chukchi Sea — as no big deal since the rig wasn’t actually drilling at the time. Uhhh…so we’re supposed to feel better? Because they can’t get the simple stuff right? Understand that nothing is “simple” in these often wild waters, but in the scheme of things, if you can’t even move your equipment around without mishap, then how can you be trusted with the relatively complex and challenging processes of drilling and completing offshore oil wells in these waters? Or mounting a swift and effective oil spill response in ice-choked seas? 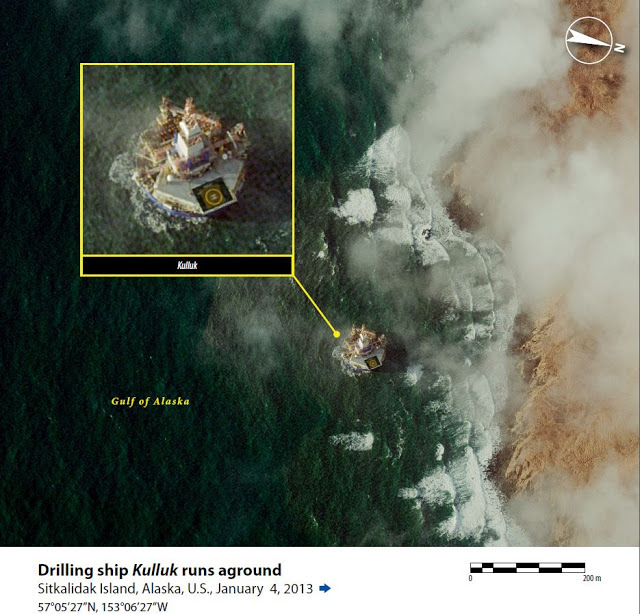 High-resolution satellite image showing the drill rig Kulluk aground off the coast of Alaska on January 4, 2013. Image courtesy DigitalGlobe. Subscribe to their WorldView report to see more great images. It’s not just technology failures that lead to disasters. Bad / risky decisionmaking plays a major part too. This November 9 news report said the Kulluk had been scheduled to spend the winter downtime in Dutch Harbor. So why was it being moved? Ostensibly for maintenance work that couldn’t be done in Dutch, but Shell admitted they were towing the Kulluk into the teeth of a major winter storm system in part to avoid paying taxes to the sate of Alaska. Shell said the storm was unexpected. This analysis of the forecasts for the area by meteorologist Cliff Mass suggests otherwise, raising the possibility that Shell risked personnel and very pricey hardware to dodge a $6 million tax bill; about 1/10th of 1 percent of the total project investment. And guess who came to the rescue of the crew and the stranded Kulluk? The US Coast Guard, courtesy of US taxpayers. What a deal. Shell was allowed to start shallow “tophole” work on two of their planned wells in the Chukchi and Beaufort seas last summer, but they still need to secure Federal approval to continue drilling these wells to their full target depths. This disturbing pattern of technical and decisionmaking failures suggests the kind of corporate culture that investigators have implicated as the underlying cause of the catastrophic BP oil spill in the Gulf in 2010. That approval needs to be withheld until investigators, regulators and the public have enough information to confidently make the correct decision. There’s no rush. The oil ain’t going anywhere. And after all, down here in the Lower 48, Shell is producing so much oil they want permission to export it to Canada. Let’s slow down and make sure we get this right. https://skytruth.org/wp-content/uploads/2013/01/Kulluk-aground-DG-4jan2013.jpg 614 640 John Amos /wp-content/uploads/2016/08/test_logo.png John Amos2013-01-11 17:27:002019-02-15 11:56:24Shell's Grounded Drill Rig Seen From Space - Other Problems Not So Obvious? What’s Going On at the BP / Deepwater Horizon Spill Site? Coal Exports: Are You Safe?